Hawaii is one of the most beautiful places in the world! With tropical weather the whole year around, interesting history and unique nature it has plenty to offer even to the most seasoned travelers. 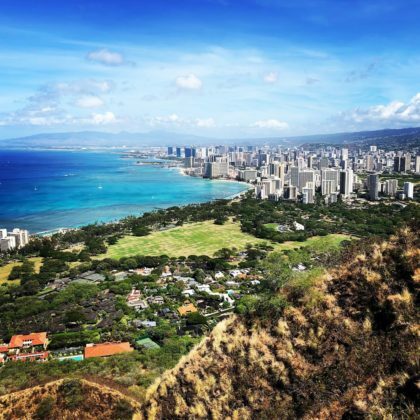 If you want to learn what to do in Hawaii, this 10 days itinerary was designed to give you absolutely the best experience of these amazing islands in just 10 days. If you have more time, I recommend you to stay longer at each point to have some time to take it easy and relax during your vacation. There are 3 islands in this trip and each of these islands was selected because it offers unique experience. These islands are Oahu, Kauai and Island of Hawaii. Try to arrive to Honolulu early and hire a car to explore north part of Oahu island before check-in time. Make sure you are changed in your beachwear or have it handy to enjoy this tropical island. 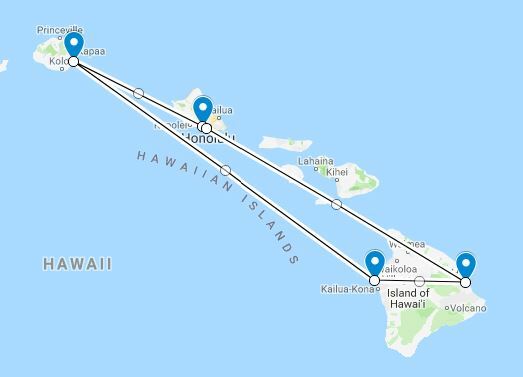 If you are arriving late, it might worth to get to Honolulu by one of the fixed price taxi services, such as Charlie’s taxi and hire a car next morning in Honolulu, so you don’t have to pay Airport pick-up surcharges. Oahu also known as “The Gathering Place” is a busy island with about 2/3 of all Hawaiian population.The island has a lot to offer and you can easily spend a week or two just relaxing and exploring this beautiful island. However, this article gives you absolutely the best experience of Hawaii islands in 10 days. Less than 1 hour drive from the airport this is the great beach to start your Hawaiian vocation. 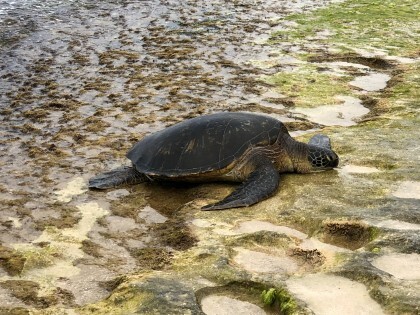 It has a free parking on the side of the road and you are guaranteed to see green sea turtles coming out to feed on the rock’s sea weed. The snorkeling here is also decent with plenty of reef fish and plenty of sea turtles feeding, especially around the rocks on the north side of the beach. Allow at least 30 mins to enjoy this beautiful beach. Once you finish with Laniakea Beach head a little farther north to Waimea Valley. You would have to pay an admission fee to enter this park, but the experience worth it. It includes an excellent botanical garden with one of the finest collections of Polynesian plants and very rare Hawaiian, as well as other island’s plants, but the best is hidden at the end of this valley. Have you ever swim in the waterfall? This is your chance to do it in the safe environment. This is absolutely the best way to cool down after the walk in the beautiful gardens. Allow at least 2 hours to enjoy gardens and the fall without rush. If you would like to do some shopping for designer brands of clothing, shoes and bags you would want to stop at Waikele Premium Outlets on your way to your accommodation in Honolulu. The outlets work till 9pm (except 6pm on Sunday) and offer the best value shopping in Hawaii. This was a retreat for Hawaiian royalty and a perfect place to finish your day. Enjoy an easy stroll and a lot of actions on this iconic beach. There is free hula dance show every Tue, Thur, Sat at 6:30pm next to famous Duke Kahanamoku (the swimmer who introduced surfing to the world) statue and panoramic views to Diamond Head. The water is crystal clear and just inviting you for a swim. Allow at least 1 hour to enjoy this beach. Diamond Head is a dormant volcano named by British sailors who thought that crystals on the beach at the bottom were diamonds. You can see this iconic landmark from Waikiki beach and panoramic view of Honolulu from the summit is very well worth 30 minutes hike. If you don’t have a car to drive there, the best way would be to get Uber. Head to this attraction as early as possible to avoid crowds and elements. The hike is exposed to the sun and would want to bring your hat, sunglasses and plenty of water for the hike. 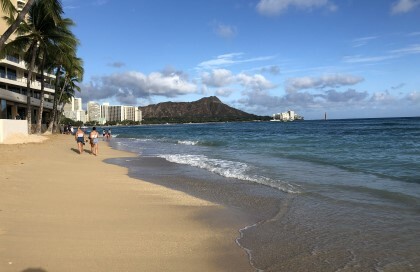 Once you finish with the hike head to Waikiki Beach to cool down. Allow at least 1 hour for this hike (return). Pearl Harbor / Arizona Memorial – this is a part of American and WWII history and anyone who enjoys history would would find this site very interesting. You would want to dedicate at least half a day to get the full experience from this site and join one of the guided tours. Allow at least 2 hours for Arizona Memorial and half day to do any tours. Hanauma Bay Nature Preserve – this beautiful bay is a short drive from Honolulu and very popular for snorkeling. It gets very busy and you would need to come very early to enjoy it (before 9am). It usually takes at least 1 hour just to get admission ticket and watch orientation video before you are allowed to the beach. Allow at least 3 hours. Tropical Tribe – this small cafe in the Waikiki area is specializing in healthy berry-based smoothies and fruit bowls. 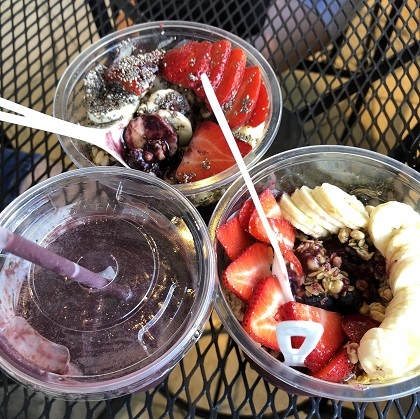 The acai bowls are very fresh and delicious and there is a great selection of toppings. If you are after healthy food, this should be on top of your list to try. Karai Crab – this is a great family friendly seafood restaurant specializing on crabs. The ambiance is very relaxing with a koi pond and a little waterfall. If you like seafood, you would love this gem hidden just outside of busy Waikiki. This is a popular place for a good reason and booking is essential. Chiba-ken – if you are are after Japanese, this is the place to go. Located on the quiet street close to the Waikiki action it has modern Japanese atmosphere with great sushi, sashimi and grilled options. You would enjoy having dinner here after busy day exploring this beautiful island. Island Vintage Shave Ice – shave ice is Hawaiian specialty, which resembles snow cones. In most places around Hawaii it’s just an ice with flavored syrup (the markup on these must be ridiculous!). Island Vintage Shave Ice takes this cheap classic on completely different level by creating very fresh desert out of it with yogurt in the center and fresh berries – truly delicious! You would want to stay in Waikiki area, which is close to Waikiki beach, airport and all main attractions. For the budget travelers Ramada Plazza Waikiki offers great value and comfortable accommodation. If you would like to enjoy some luxury Hilton Hawaiian Village offers panoramic ocean views, own private lagoon, multiple pools, watersides and a lot of activities to keep you and your family busy. 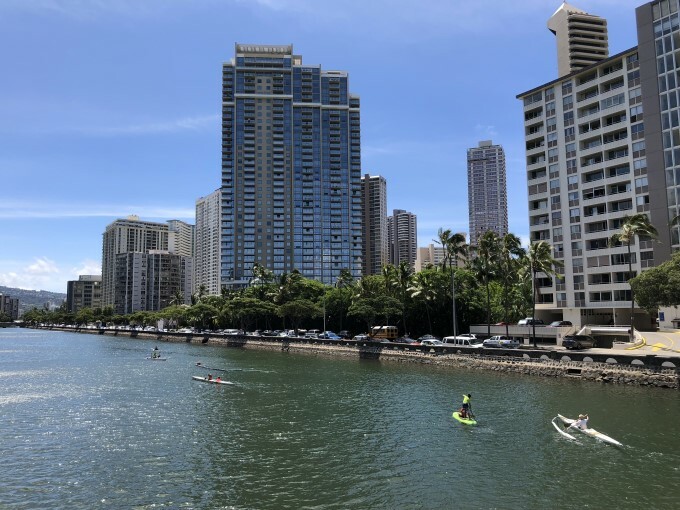 Sheraton Waikiki provides another luxury option in the heart of Waikiki beach with lovely infinity pool for adults and watersides for the kids. Kauai, “Garden Isle” where natural beauty of Hawaii shows itself at its best. This lush island with 2 Natural Wonders of the World located next to each other is packed with stunning landscape views. 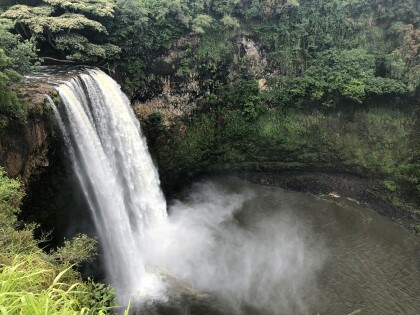 This is a photographer’s dream with perfect waterfalls, dramatic cliffs and canyons.Kauai was featured in more than 70 Holllywood movies with Jurassic Park series filmed exclusively on this beautiful island. The best way is to explore the island is to hire the car and stay on the north shore of the island around Princeville area. This would give you early start to enjoy Hanalei Bay and explore amazing Na Pali coast. This little town seems to be frozen in time with small boutique and antique shops. It’s a perfect place to spend your first evening in Kauai and sets the mood for the rest of your stay on this amazing island. It has classic Hawaiian views with emerald mountains and magical laid-back feeling. 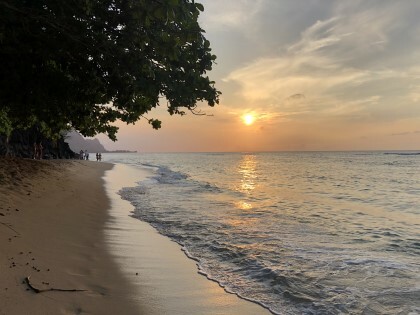 Hanalei Bay Beach, where hit musical South Pacific was filmed, surrounded by mountains comes in the top 10 America’s beaches lists and a great place to enjoy a sunset. Allow at least 2 hours to enjoy this town and the Bay. Na Pali Coast State Park is one of the top 300 Wonders of World and offers truly breathtaking panoramic views. The best way to see this coast is to hike on Kalalau Trail. This hike has been in the top list of the most beautiful hikes in the world. However, it’s also a dangerous hike with few people falling to their deaths from these beautiful cliffs. Only expert hikers can complete full 35 km / 22 miles trail in a day and would require a permit, which you would need to get months in advance. Most people take this trail to Hanakapiai Beach and Falls only, which takes around 2 hours return. Either way you should start your day early and drive to the parking next to Ke’e Beach. It can be challenging in places with slippery mud, so wear your best hiking shoes. The scenery is absolutely breathtaking and worth the effort. Be well prepared with a hat, bathing suit and plenty of water. Allow at least 3 hours to enjoy this area. After a long day exploring Na Pali Coast and Kauai North Coast head to Hideaway Beach in Princeville for a beautiful sunset. This little beach next to St. Regis Resort has spectacular views and perfect perfect to finish your day. The public parking at the top of the beach is very small and you might need to park somewhere around Hideaways Pizza Pub and walk to the area. Waimea Canyon is one of the top 1000 Wonders of the World and also known as the Grand Canyon of the Pacific. Access to the Waimea Canyon State Park is on the west side of the island views are spectacular. If you can afford to take a helicopter ride, this would likely be the most beautiful helicopter ride in your life. 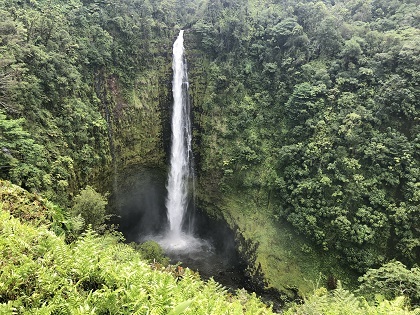 We recommend Island Helicopters, which also has an option to land at Manawaipuna waterfalls, which you see as the opening scene in Jurassic Park movie. 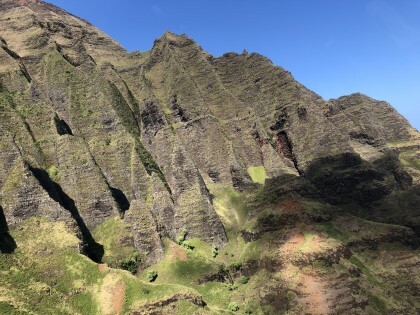 The helicopter ride would only take 1 hour and a half and would allow you to appreciate the full beauty of Kauai and Waimea Canyon. 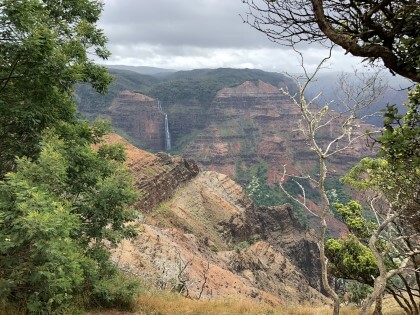 You would still have have time to drive to Waimea Canyon State Park and take a Pihea Trail hike to Pihea Vista junction, which offers a panoramic view to picturesque to Hanakoa Valley. Enjoy the video with a footage of the helicopter flight around Waimea canyon – https://www.youtube.com/watch?v=y_Y7BZLBM94. 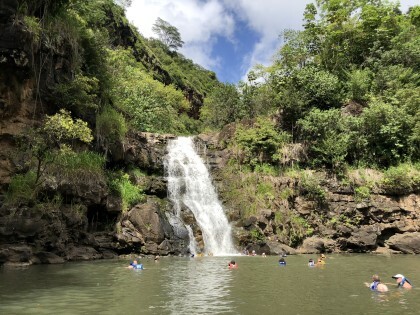 Wailua Falls – this powerful waterfall is next Lihue and worth short detour on your way to Princeville. It’s easily accessible by the car and the view from the top where you park the car is beautiful. Allow at least 30 mins. 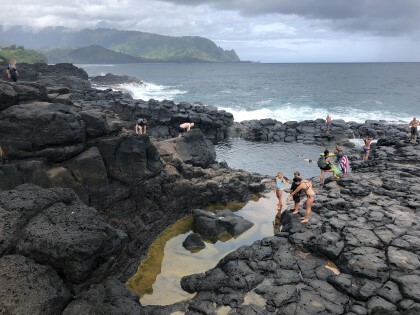 Queen’s Bath – this tide pool in Princeville is actually a sinkhole and gives a perfect opportunity to cool down and relax after the flight and drive to Princeville area. The crystal clear water in the pool has remarkable sea life with sea urchins, goby fish and angelfish. However to get to the pool you would need to go down through very slippery area and is considered dangerous during high surf with multiple people being swept off rocks by freak waves. If you have mobility issues or surf is high avoid this area. Allow at least 1 hour to enjoy this pool. After lush Kauai Island of Hawai’i commonly referred as Big Island with its alien landscape of cooled lava fields feels like you arrived on a different planet. 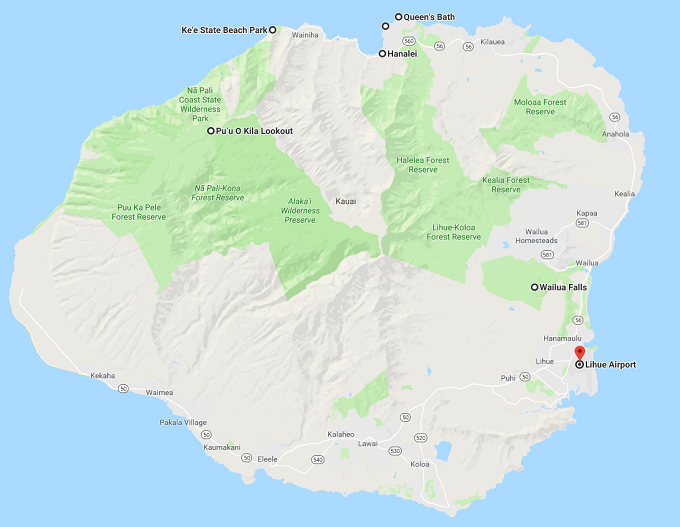 This is the biggest island in Hawaii, so you would need to do a lot of driving to explore it. Thankfully there are 2 airports, one on the west side in Kona and another on the east side in Hilo. 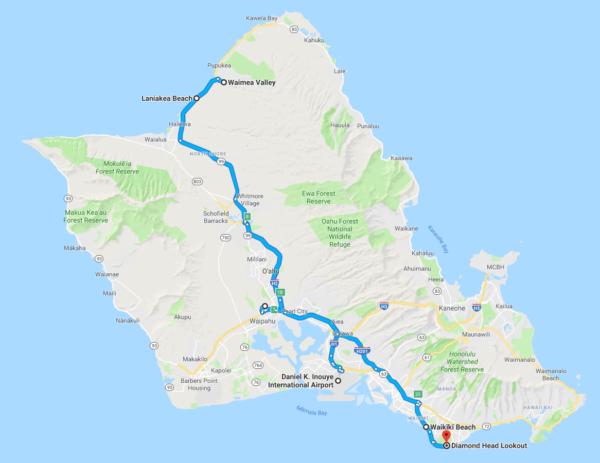 There are top attractions from both sides and to optimize your time you would want to arrive in Kona airport, hire a car and explore the west side first, then drive to Hilo and depart from there. East side has the best snorkeling in Hawaii and the west side has active volcanoes. 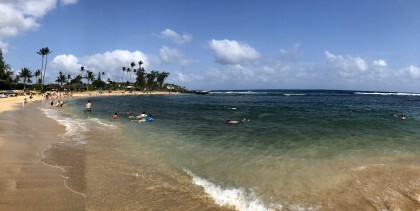 This is the nicest beach on the island with excellent snorkeling on the north side and the great place to relax after your flight from Kauai. 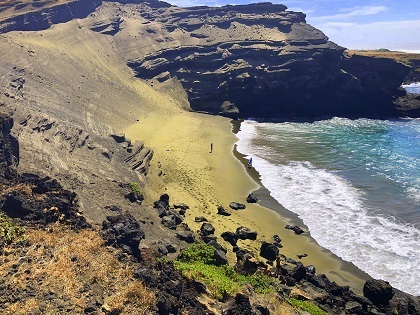 You can can also take a short hike to nearby Mauna Kea beach. The views from the trail are spectacular and after a hot hike you can cool down yourself in the beautiful water of Mauna Kea beach. There is a small fee to park on this beach, but it’s worth it. This is an amazing experience and should be on a bucket list of every snorkeler. There are few operators providing this tour with most starting the tour from Honokohau Harbor. The actual site is next to Sharaton Kona Resort where these graceful creatures come to feed on the zooplankton. We recommend Hawaii Oceanic operator who is on of the few to start earlier to beat the crown and allows sunset snorkeling before the chaotic feeding frenzy. You would likely have a chance to swim next to these gentle giants while the crew assembles the lights on the floating device. Once the darkness comes snorkelers hold on the floating device, which has strong LED lights attracting plankton, which in turn attracts manta rays, so you will see them feeding just in front of you. This mesmerizing experience is not be be missed. Allow at least 3 hours to enjoy this tour. This is the best snorkeling place in Hawaii! It’s close to Kealakekua Bay where Captain James Cook Monument is located and which usually gets the crown for snorkeling, but the access to this place is much easier. Access to Captain James Cook Monument is tricky with either long and unpleasant hike exposed to the elements or hiring (most probably from illegal operators) a kayak and kayaking there. Either way is not ideal and Two Step on Honaunau Beach is the great alternative with very easy access, crystal clear water and amazing snorkeling. This is one of the only 4 green beaches in the world! It gets the green color from olivine mineral exposed by volcanic eruption. The whole sand on this beach consists mainly from olivine grains sparkling invitingly reflecting the sun. There is about an hour hike to get to this amazing beach and you would be greeted by locals who provide unregulated 4X4 shuttle services to the beach. The ride is bumpy and trucks are destroying the local landscape, the hike is a free and eco-friendly option. You can get to the boat ramp, park there and start the hike following the coast to this beach. You might be able to see a local Hawaiian seal on the beach next to the boat ramp and the sand is already green there. Try to get to the area as early as possible to avoid crowds and start the hike before the sun is in the full power. The hike is very exposed to both sun and wind, so make sure you dress properly, wind proof hat and hiking shoes or sturdy sandals are highly recommended. Don’t forget the drinking water and swimming suite to enjoy the beach after this exhausting hike. Allow at least 2.5 hours to enjoy this beach (if hiking). There are few black sand beaches on the Big Island, however Punaluʻu Beach is the nicest one. 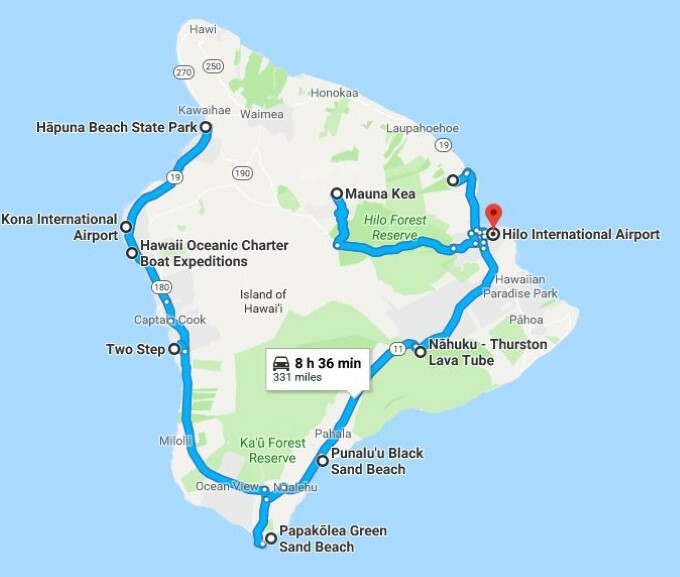 It has an easy parking right next to the beach and close to the Green Sand beach, which makes an easy stop over after Papakolea on your way to Hilo. 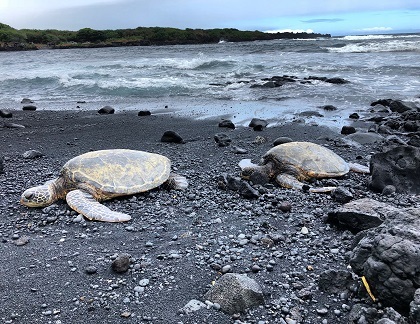 There are usually hawksbill or green turtles basking on this beach and volcanic sand is very black. Allow at least 30 mins to enjoy this beach. 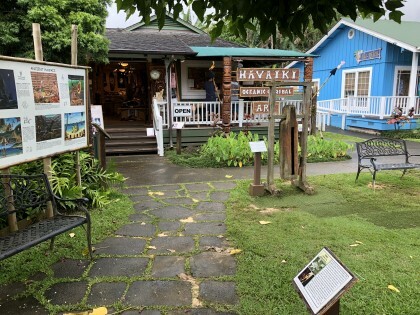 Hilo is on the east side of the Big Island and provides the best access to Hawaii Volcanoes National Park, lava tubes, lava tunnels and amazing Mauna Kea, dormant volcano with accessible highest point in Hawaii of 4,207 m (13,802 ft) above sea level. Hawaii Volcanoes National Park is one of the top 300 Wonders of World and contains not one, but two of the most active volcanoes in the world! The visitor center is in the park has interesting displays and information about recent volcanic eruption. There is a lot of volcanic activity in the park and the landscape keeps changing. There are sulphur vents, lava tunnels, dramatic views to the crater and even lava flows. Check the visitor center what sections of the park are open to the public and offer the best experience. Allow at least 2 hours to enjoy this park. You need to do a some planning to enjoy this dormant volcano. It’s the highest point in Hawaii and would be highlight of your trip to the Big Island. The summit of of this mountain is one of the best site in the world for the astronomy. This is where iconic telescopes featured in multiple movies are located and the access to the summit is relatively easy. You can visit visitor’s center at respectable 2,800 m / 9,200 foot on your sedan two-wheel drive, but would need 4X4 to get any higher. 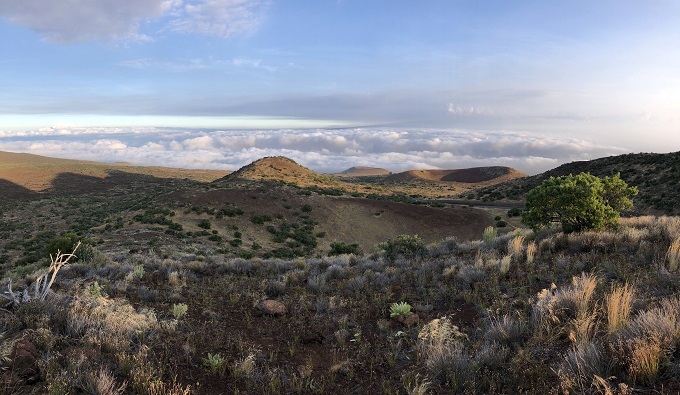 You would want to arrive at the summit or the visitor center before sunset, so you can enjoy spectacular views above the cloud level from this mountain. If you are planning to get all the way to the summit, keep in mind that there is only 40% of oxygen levels there and you would need to acclimatize at least for half an hour in the visitor center. Kids below 12 and people with respiratory or heart issues should not be attempting to get to the summit and third of the visitors experience attitude sickness. The driving is also dangerous by a steep narrow road and a lot of visitors book an expensive guide (usually well in advance) to get there. If visiting the summit is not on your bucket least, we recommend to drive to the visitor center half an hour before sunset and take a short hike on the taller hill across the road. You would enjoy beautiful views without much of the hassle. Dress appropriately, it gets very cold even next to the visitor’s center and with the sun gone, the temperature can drop close to 0C. There is a free Star Gazing program every day except Monday and Sunday from 7:00 pm until 10:00 pm where you can enjoy astronomer’s presentations and look through the powerful telescope on far away stars and planets. Allow at least 3 hours to enjoy this mountain. The cave is actually a part of 25 miles long lava tube. There are a lot of lava tubes on the Big Island and this one is absolutely free, has a dramatic rain forest entrance and just next to Hilo. 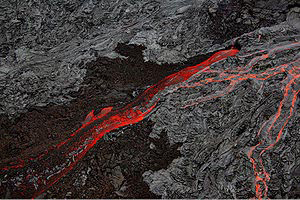 There are wide varieties of lava formations with some red once, which is quite rare. Make sure you bring your flashlight and wear sturdy shoes to explore this cave. There are numerous offshoots available for exploration, but you it’s recommended you to wear a hard hat with a headlight, if you would like to spend time exploring some of the farther sections. Allow at least 30 mins to explore this cave. 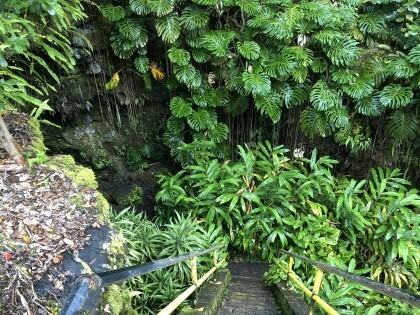 This easily accessible park is a close drive north of Hilo. The park is very lush and relaxing walk through the the rain forest would bring you to gorgeous 135m / 442f tall waterfall. This place has a spiritual feel to it and a great refreshing contrast compare to harsh lava fields south of Hilo. Allow at least 30 mins to enjoy this park. This is your last day in Hawaii before you go home and the great time to catch up on something you missed in your first 2 days. Do last day shopping in modern Ala Moana Center or just enjoy vibrant Waikiki beach with its never tiring energy. Follow us on Instagram – @1000wondersoftheworld or subscribe to our Wonders of the World YouTube channel to view videos of this as well as other trips.